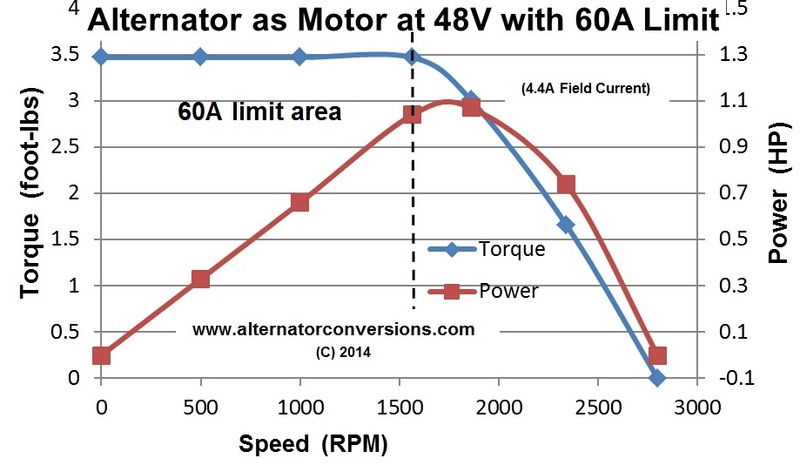 Alternator Technology Page: Torque and Power Curves, Technical Overview, Datasheet, Specifications, Parameters. Speed-Torque Curves, Speed-Power Curves, Specifications, Datasheet, and Other Alternator Technical Information. This page contains alternator technical information for alternators converted to motors. Alternator technical information on this page may also be useful for alternators used in conventional manner (to generate electrical power) in many applictions. I. Speed-Torque Curves and Speed-Power Curves for a small alternator converted to a Hybrid Brushless Motor as shown in the Alternator Conversion Manual. The alternator is from a Chevrolet Camaro. II. Main Points Regarding an Alternator Converted to a Motor. Here we call an alternator re-worked to a Motor an "Alternator Motor" or a "Hybrid Brushless Motor"
A conventional electric brushless motor is called a "BLDC". A conventional DC motor is just called a "DC Motor." Alternator Motors produce there power by high RPM compared to BLDC or DC Motor. That is, Alternator Motors tend to "rev up" to produce power at higher speeds versus most other electric motors. Alternator Motors are "high-reving" motors. This is true because Alternator Motors have lower torque than other electric motors, because Alternators have relatively large effective air gaps in their magnetic circuits and relatively low permeability in the rotor electromagnet core. Since Power = Speed x Torque, Alternator Motors make power by higher speed to compensate for lower torque. Here we call Alternator Motors Hybrid Brushless Motors because all power drive current to this motor is brushless; that is, drive current passes only through the stator and does not pass through any brushes, as in a conventional DC motor. Only a small (0 – 4 Amp) field current passes through brushes and smooth slip rings to the rotor to power the electromagnet that produces the rotor magnetic field; hence, we call this "field current." This is a very reliable design with minimal abrasion (unlike commutators in conventional DC motors), which is why this brush-slip ring design is typically used in resolvers and synchros on aircraft and anywhere else high-reliability is needed. We call an alternator re-worked as a motor a "Hybrid Brushless Motor" since it has a combination of brushless power drive current and only a small DC field current that passes through brushes and slip rings. Alternator motors have high power/weight ratios, which make them good candidates for portable power equipment, small electric vehicles, electric aircraft and drones, or anywhere else light weight motor power is needed. Alternator Motors don't usually need complicated Space Vector sine drives to minimize torque ripple, unlike BLDC because Alternator Motors also usually have alot more poles than brushless motors; for example, the Chevrolet alternator tested here has 36 poles, which is much more than a typical similar power BLDC. An advantage of the higher speed requirement to produce power plus the higher number of poles for an alternator motor is that simple 6-step ("trapezoidal") inverter drives can often be used instead of more complicated Space Vector sinusoidal drives because the high speed plus large number of poles of an alternator motor tends to "naturally" smooth out torque, tending to have less torque ripple. You can say that an Alternator Motor has less torque granularity as a result of the combination of its high speed and large number of poles. 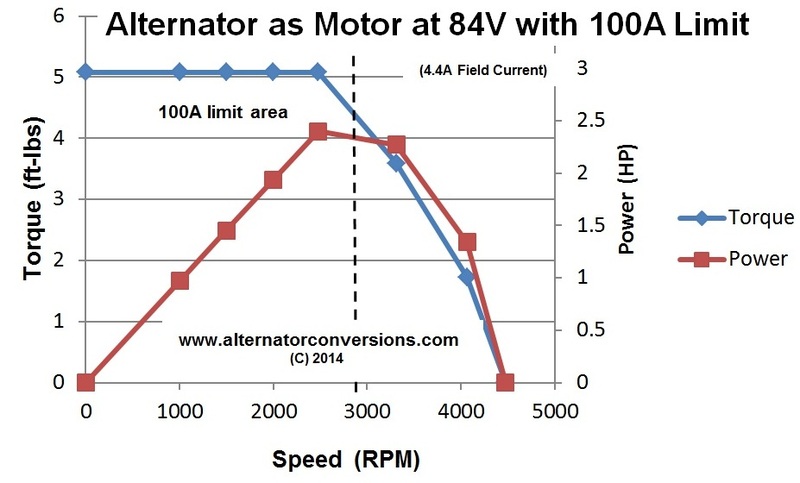 Alternator Motors have advantage over BLDC because torque can be adjusted by simply adjusting the field current, versus fixed field current from rare earth permanent magnets in BLDC. As a result, the Alternator Motor completely avoids complicated Field-Oriented Control Field Weakening DQ transform (Park-Clark) schemes needed to enable high-speed operation of BLDC to reduce back-emf. The Alternator Motor has none of this complexity. The Alternator Motor does not depend on costly rare earth magnets, like BLDC motors. This is important because certain countries have a monopoly on the raw materials for rare earth magnets, which is a high cost risk for BLDC motors. Alternator Motors do not have this risk. Controls: throttle with 1.0k ohm pot., and neutral and drive toggle switch. Both can mount remote. Automatic high-speed pulse-by-pulse current limit. Reverse polarity protection on both main power (80 A) and control power. 1. 2.4 HP measured on dynamometer 3.0HP by analysis. 3. Can use 7 storage batteries in series from car, motorcycle, lawn tractor, etc. Can also use appropriately-sized lithium-ion to reduce size and weight. 4. Can tap off one of 12V series battery in main power for control power. 5. This is a relatively small alternator. Typically, larger alternators produce more power and torque, and vice-versa. IV. Video below is a Dynamometer Test of the net output HP (Horse Power) of a car alternator converted to a motor. Next, the load is abruptly raised from zero (no load) to 2.8 HP. The alternator speed drops from 5200 RPM to 2800 RPM from this load. The alternator speed drops because the current is limited to 100 Amps.